Mysuru girl M.V. 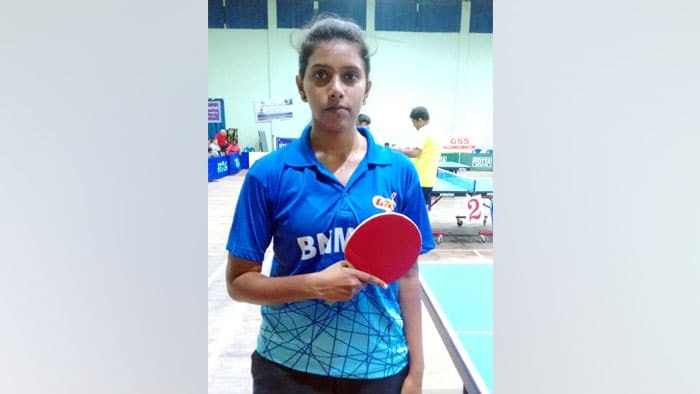 Spoorthy, taking part in the Kosmos Cup Karnataka State Ranking Table Tennis Tournament held in Bengaluru on Monday, lost her Women’s Singles semi-final encounter against ultimate champion V. Kushi. Kushi beat Spoorthy 11-7, 11-3, 14-12, 11-6 to enter the title round. In the final, Kushi beat A. Samyuktha 11-7, 11-8, 11-8, 9-11, 13-11. In the youth girls section, Kushi beat M.V. Spoorthy 11-6, 11-6, 11-7, 12-10 in the semi-finals.